Thursday, Labour leader Jeremy Corbyn the the House that "After the last few days of government chaos and some defeats, all of us now have the opportunity and the responsibility to work together to find a solution to the crisis facing this country, where the government has so dramatically failed to do so. We have begun to hold meetings with members across the house to find a consensus and a compromise that meets the needs of our country." However, a vote "enable the House of Commons to find a way forward that can command majority support" was narrowly defeated-- 314 to 312. On the other hand, the vote for a second referendum, which seems the only sane thing to do, was overwhelmingly defeated-- 334-85. But, a Brexit vote finally went Theresa May's way. 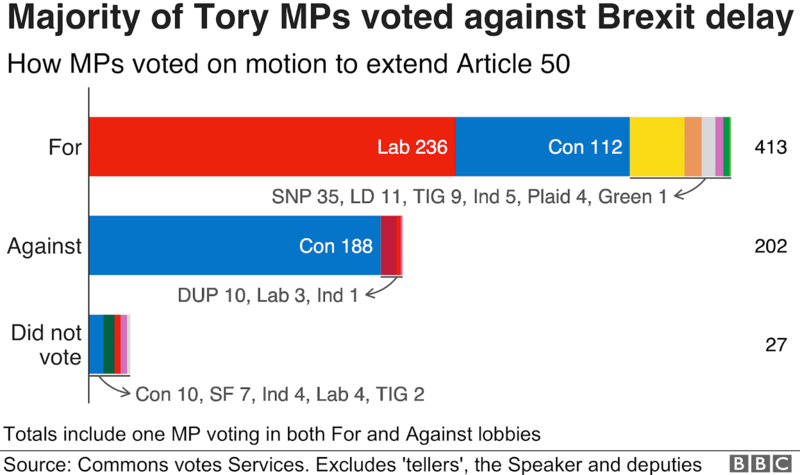 413 members voted to delay Brexit, while 202 voted against. It took support from Labour to pass it and 8 of her own cabinet ministers, including Brexit secretary Steve Barclay, voted against her. The delay is for at least 3 months but it could be a lot longer. All 27 EU members have to agree to grant the UK an extension. EU Council president Donald Tusk favors an ever longer extension than the 3 months May is asking for. The Dutch prime minister, Mark Rutte, isn't as optimist and conciliatory as Tusk. "What’s the point of whining on for months on end while we have been going around in circles for two years?" he asked. "When Theresa May comes asking us for an extension, our response will be: 'For what? To what end?'" Guardian columnist Jonathan Freedland, wrote that May has finally got the Brexiters where she wants them. "MPs," he wrote, "had the chance to take back control of Brexit-- wresting this tortured process from a weak, flailing and moribund government-- and they ducked it... losing by just two votes, 312 to 314, but MPs passed up the opportunity to take charge and say, at long last, what kind of Brexit they want. They preferred instead to grant Theresa May yet another lifeline for her own deal-- which, incredibly, will come back for a third meaningful vote on Tuesday. The lever that was offered to MPs, by which they might have finally got a grip on the Brexit crisis, was a proposal from Hilary Benn [Labour] that would have seen a series of votes allowing MPs to indicate their preferred Brexit plan-- whether that be Norway plus or a second referendum or every shade in between. No longer would May retain the initiative, with the power to confine MPs to a single, binary choice: my way or the highway. Had it gone through, it would have confirmed what the rest of this week had already suggested: that power is haemorrhaging away from this prime minister, that this government is in office but not in power, that it is parliament rather than Downing Street that now calls the shots. But, by a whisker, May’s administration clung on, the party whip having lost not all of its sting. In fact, it was six Brexiter Labour MPs who saved May from what would have been further humiliation, voting against their colleague Benn and giving her a stay of execution. It now means the prime minister can stage next Tuesday’s vote the way she wants it: as an ultimatum to the ultras of the European Research Group and the Democratic Unionist party. Thanks to another, much more comfortable vote this evening, approving in principle an extension of article 50, those intransigents will now face a sharp dilemma. The ERG and DUP either swallow their objections and vote for May’s deal, or they face the prospect of a long delay to Brexit-- perhaps for the best part of two years. Given the mayhem on show these past few days, who would bet what might happen to their precious Brexit project between now and 2021? They might lose it altogether. That is the stark, binary choice May has always wanted to press upon the Brexiters, and the defeat of the Benn amendment allows her to do it. She-- and her plan-- get to live till Tuesday. Some of her colleagues want to say that something else momentous was decided this evening: the rejection of a second referendum. It’s true that the Commons delivered a crushing rejection of that idea. True too that the margin of defeat will be used to taunt and torment people’s vote campaigners for days, maybe weeks, to come: “Your precious second referendum was rejected even more decisively than May’s plan back in January!” they’ll say. But that taunt will only have a tenuous relationship to the truth, because this was hardly a real test of the idea. Labour abstained on the proposal, while even the official People’s Vote campaign said now was not the right time to push it. It was tabled by Sarah Wollaston of the Independent Group, perhaps to embarrass Labour and highlight the party’s lukewarm support for the campaign, but it was hardly smart tactics: it now allows opponents to claim there is no support in the Commons for a second vote when, in fact, there’s much more than tonight’s vote suggests. It was a misstep by the remain camp, which has demonstrated that it is far from united, and riven with tensions of its own. One almost-clear thing does emerge from tonight’s vote. That date you had in your diary, circled in joyful red or in sombre black depending on your point of view-- you can now uncircle it. Whatever else happens, it is all but certain that Britain will not be leaving the European Union on 29 March. That’s because MPs voted by 413 votes to 202 to request an extension of article 50. I say request, because it’s up to the 27 EU nations that Britain will soon leave behind to give their blessing to a delay. Still, given that they also don’t want a no-deal crash-out in 15 days’ time, it’s a good bet they will say yes. Even if May works a Lazarus miracle on Tuesday, winning approval for her Brexit deal buried twice over by successive Commons defeats, she will still need an extension into the summer to get all the technical stuff through, and that’s even before talks get started on the future relationship. So doomsday-- or day of liberation, if that’s how you see it-- is no longer scheduled for 29 March. This Brexit saga will go on and on. Labels: Brexit, European Union, Jeremy Corbyn, Theresa May, U.K.
At the rate things are happening (or not) in the UK, I see Scotland deciding they aren't willing to remain a member. Northern Ireland may also see greener pastures rejoining with Eire (admittedly a long shot with the growing religions BS starting up again). The remaining question is Wales. As their major asset is coal, they aren't going to be a strong economically to even consider departing. But even if no decision is reached legislatively, economics will step in eventually, and the UK could crumble to dust. Let their isolationists choke on that. The UK is tenuous economically anyway. brexit may only serve to accelerate the inevitable. The purpose of the EU was to entangle the members economically such that more wars would be avoided out of pure economics. They did it poorly, granted, with each member losing their ability to make monetary policy decisions unilaterally when necessary, but all in all it's been a success. What May is seeking is a break from the strictures of the EU while keeping all the benefits. Trying to have her cake and eat it too. If I were the EU, I'd just cut the pins out from under May and let the UK go it alone. It's very likely that the NI and Eire shitstorm might be relit and that would be a tragedy. And it might lead the Scots to secede so as to rejoin the EU. could be a huge mess. But voters there did vote to do it... so they should suffer the consequences, like we have been for 40 years with our neolib/neocon religion. what is it with stupid white anglos, anyway?